Using chess to sell Fosters? It is not the move you are thinking of. I finally got to see some chess on my holiday, with young Harry Press taking a board for the Leeds City Centre Chess Club. It was a second division match in the Yorkshire League, and Leeds were playing Sheffield E.
A number of things impressed me about the match. Firstly was the fact that the Sheffield team was an E team. As the matches are played over 8 boards, the means they would have at least 40 players willing to turn our for the club. That compares well with Australian teams events, which often struggle to get teams of 4 players to turn up. The other thing I noted was the match was played on a Saturday afternoon, which is often the peak time for other weekend activities. Nonetheless both teams turned up with a full complement. The competition uses the slightly odd time control of 42 moves in 105 minutes, followed by 15 minutes to finish. I assume this is both historical, and to account to the fact that not all clubs use digital clocks (although Leeds were using them). In the end Leeds scored a 6.5-1.5 win, but they did out rate Sheffield on all boards. Harry was slotted in on board 5, and managed to help the team, picking up pawns, and then the point. Just as in 2010, overseas travel has taken me out of Canberra just when the Lifeline Bookfair is on. In fact the whole thing had slipped my mind, until a quick catch up of news from home showed a queue forming outside the venue at around 6am. I guess it gives others a chance to pillage the chess books, assuming there are any (It is often feast or famine with the bookfair). The 2013 FIDE Congress is only a week away, and various rule changes are on the table. Of direct concern to me are changes to the Swiss Pairing Rules, and to the Laws of Chess. This is because I am on the commissions that deal with these topics, so will be involved in the decision making process. Both commissions have put the proposed changes online. Changes to the swiss pairing rules can be found at pairings.fide.com, while proposed rule changes can be found at rules.fide.com. In both cases the best place to find the relevant documents is under the Meeting Minutes link. Note: In deciding on the proposals it isn't always an 'all or nothing' vote. In some cases there are other proposals which are variations on the published ones, while some proposals may be modified as part of the discussion. I'm not saying the following game is a refutation of the Trompowsky, but it at least gives ideas on how to play the Black side with doubled f pawns. Having a 2600+ GM handling the dark side also helps, but a quick win is still a win. I've just seen a chess joke (which I will repeat another time) that relies on left handed chess players for its humour. It did get me thinking about whether being left handed makes you a better chess player, Certainly right handed opponents appreciate you more if you are left handed (the clock is on the best side for both players) but does it count for anything more than that. Apart from the usual lefty propaganda (left handers are just smarter than right handers), the only real numbers I have seen are a 1988 study which found 16.9% of USCF players were left handed, a figure that rises to 18.1% for Master players. This is above the global average (11%), and therefore suggests that chess attracts left handers, but whether this makes them better is another question. Around 25 years ago I heard reports from Yugoslavia of 24 hour blitz events. These were 100 round events, which tested both skill and endurance. 91/100 was one winning score I saw, although I wonder if the 9 points were lost while the player was asleep. It seems that such traditions continue, with the 31st International Chess Marathon of Saverne. This will be held over the weekend of the 28th & 29th of September in Saverne, France, and will be a 32 round rapid events (G/20m). The report from Chessdom has all the details (if you are in that neck of the woods) including a couple of interesting photos from previous events. At this stage there are 50 entrants, including a couple of GM's, and I suspect the final entry list will contain plenty more committed souls. One of the more interesting places in England is Glastonbury. Most famous as the possible last resting place of the possible King Arthur, there are also legends involving one J. Christ visiting the place as a young man. There is also the Glastonbury Tor, which is reputed to be the doorway to Hades. I visited the village around 17 years ago, and today I made another visit. Some things have changed in the last decade and a half in the UK, including how hard it is to get to places. As a result I did not have time to climb the Tor, but I did find the time to lay some chess, albeit with my son. We played the game blindfold (as we occasionally do), and so although it started in a coffee shop, it was played in a number of locations throughout the village. The game ended in a timely manner as we reached the car to drive home, with me realising I had miscalculated the pawn ending, moving my king in the wrong direction. I saw a strange ad on UK TV last night, which mixed chess with beer (a natural mix from the chess direction, but not often seen coming the other way). It was an ad for Fosters (which people still apparently drink in the UK, though not in Australia), and had one mate ringing another mate about how deal with social situations in France. The mate giving the advice was involved in a game of chess against a (obligatory) bikini wearing female opponent. I could not pick up the actual position, but the young lass seemed to be happy with how the game was going. Not quite sure what the 'sell' was with this commercial, but the fact that I am blogging about it obviously means it worked on one level. If you find yourself in Paris, then a walk along the left bank of the Seine is worth taking. Apart from the enormous number of beautiful and historical buildings, you may be able to find some real gems in the book stalls that line the footpath. They seem to sell a mix of books, paintings and souvenirs, often specialising in vintage publications (newspapers, magazines). The topics are quite varied, but I did stumble upon one stall that was packed with chess books. It was located near the Saint-Michel Notre Dame metro station, and had around 100 second hand chess books on offer. Around half were in English while the rest were in French/Russian/Polish etc. They were all priced around 10 to 12 euros, so bargains could be had if you found the right book. Once again time was my enemy (and the fact it was raining(, otherwise I would have spent more time investigating the entire catalogue. So far the holiday has not had as much chess content as I, or Harry, would have liked. I did spend a day walking through Kew Gardens with Stewart Rueben, where we discussed new changes to the Laws of Chess, but otherwise it is non chess activities that have taken up most of my time. Today will be no different, as a trip to the Louvre will take up most of the day. However, If I see some chess related art work, I will try and souvenir it! The holidaying continues at full pace, with a two day trip to Paris starting tomorrow. Unfortunately my timing was a little out, as I am arriving (and departing) a few days before the start of the Paris Grand Prix event. This is the final event in the 2012-2013 FIDE Grand Prix Series, and although the overall winner is already known (Topalov), there is still the second Candidates spot up for grabs. Caruana or Grischuk have the chance to overtake Mamedyarov (if I have read the result table correctly), but only outright first will do. The whole thin kicks off on the 21st of September and runs through to the 5th of October (by which time I will have moved on to Estonia). I've been catching random bits of chess news since my holiday started, but it time to catch up properly. The big news event at the moment is the Sinquefield Cup in St Louis, where Magnus Carlsen leads the strong 4 player (Aronian, Nakamura, Kamsky) event. The final round is today, starting at a time I am yet to work out. The other big event is the Women's World Championship match in China. Former champion Hou Yifan is playing current champion Anna Ushenina. After 3 games Yifan has taken a two point lead (wins in games 1&3). Interestingly both wins have been with the black pieces. The match is over a short 10 games, so it will be a test of the theory that the player in front can now coast to victory by drawing their remaining games. I'm still in travel mode, and am finding the change in time zones throwing me out. When I am at home (in Australia) I usually blog just before I go to bed a midnight, meaning most people read my posts in the morning. On the other side of the world (UK) I find that early morning blogging is easier, as I am still waking at around 6 am. So my posts are more about what I am going to do with the day, rather than what I have just done. Today's travels should take me to the British Museum, and then on to Madame Tussauds. As we (myself and family) are doing most of travels on foot, the journey between to two will take us past the Chess & Bridge Shop in Baker Street. I last visited this shop 17 years ago (on my honeymoon), when it was located on Euston Rd. Harry and I will stick our heads in to see what was on offer, although we are under strict instructions not to spend to much! I've spent the last 48 hours moving through airports, planes and sleep, although I did get some sightseeing done on arrival in London. Today will be the first full day in England, and it is time to hit the museums. Last time I was in London for any length of time was on my honeymoon back in 1996. 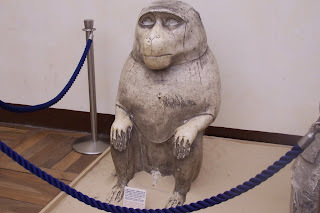 One of the things I saw then were the Lewis Chessmen, at the British Museum. Since then there has been some controversy associated with them, as the clamour for a permanent return to Scotland has grown. I seem to recall that there were concerns that if they were taken to Scotland for exhibition, they may not come back (NB 11 pieces are already on display in Edinburgh). As this does not seemed to have happened, I assume that the respective legal teams successfully inserted a 'cross my heart and hope to die' clause into the exhibition contracts. Ah Sydney International Airport. You never fail to disappoint. Crappy wifi, and $10 toasted chicken sandwhiches. At least my patronage will be necessarily brief. I managed to squeeze one more game of chess in tonight, just before flying off for holidays tomorrow. It started off as a French, and I played the off beat 2.b3. Despite being worse out of the opening, I whipped up some tactics in the centre, and managed to win the ending after giving up 2 pieces for a rook (and pawns). But there was a big tactical hole in the game, so I instead I will show a game that kind of looks like the game. I played this other game at the 2002 Olympiad. I managed to miss a trick in the opening (which was a Caro-Kan) and it looked like I was getting done over on the queenside. However my opponent missed a dangerous threat on the other side of the board and I went from losing to winning in the space of 1 move. However we then both missed the best lines in the position, and although I was far better in the final position bailed with a draw by repetition. Helpmates are the kind of problems that most chessplayers avoid. The usual complaint is that 'it has nothing to do with normal chess', which is mainly true. But as with other sorts of exercise, the effort in solving such puzzles may help improve your overall thought process. As a bit of a taste here is an interesting helpmate in 2 (sourced from Solving in Style by John Nunn). 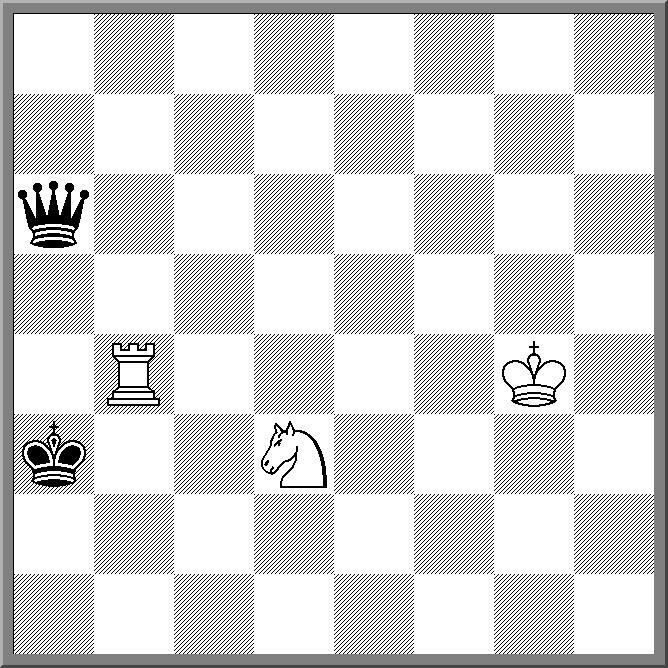 The convention for helpmates is that Black moves first and White delivers mate on their 2nd move (with Blacks help). However there is more this problem than finding one solution. 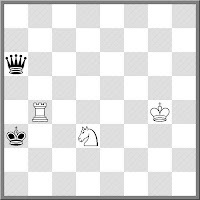 Once you have found the first answer, replace the Black piece on a6 with a Rook, then a Bishop, Knight and finally a pawn. So rather than 1 puzzle, it is actually 5 puzzles in 1. See if you can come up with the 5 answers. I had a bit of a giggle at the following, which was played at Street Chess on Saturday. I started watching at move 5, when White was threatening Rxh7, even if Black played the plausible Nf6. Black decide to give up an exchange (unnecessarily), but it did pose problems for White. At move 10 White did have a chance to keep a clear advantage, but only by playing a move that would have been hard to come up with. 10.Kc3! looks to be best, protecting the d pawn and avoiding most of Black's checks. Instead White chose the 'obvious' plan of Qg5-Bh3, but Black was able to force a draw by repetition. I'm heading overseas in a few days (Wednesday to be exact). Unlike most of my recent trips it will (a) last longer than 3 days and (b) have not as much to do with chess. The main purpose of the trip is simply to have a holiday with the family. Most of the trip will be spent in the UK, with a side trip to Paris. However their will be a detour to Estonia, to attend the 2013 FIDE Congress towards the end of the trip. As with all my trips, I will try and keep this blog up to date, depending on internet access. Of course it may have less to do with chess over the next month, and function more as a travelogue, but if I see any good chess items on my travels I'll be sure to report them. Until recently both the FIDE Rules and Tournament Regulations Commission (RTRC) and the FIDE Swiss Pairing Programs Commission (SPP) have been without official websites. Information from these commissions was either contained in the FIDE Handbook or not available at all. But following on from other FIDE commissions, they both now have websites up and running. The RTRC website is rules.fide.com and contains links to the current Laws of Chess, as well as information on the upcoming commission meeting in Tallinn. The SPP website is pairings.fide.com, and contains links to the current approved FIDE pairing rules (plus other information). As the sites have just been set up, information is still fairly limited, but I expect they will grow over the next few months. And I have a random article from the internet to support this claim. Actually the article does provide references for this claim, as all good articles should. (I've read too many 'University studies have shown ...' articles to accept this kind of hand waving). But I am no expert in the field so am in no position to judge if these claims are any stronger than the 'ability and intelligence aren't linked' counter arguments. What I do know from my own experience is that memory and recall are important, as is the ability to draw objective conclusions. Whether these are traits of above average intelligence I do not know. As part of my obligation to show every Traxler game I play, I present the following. There was a bit of nostalgia with this one, as I routinely handed out severe beatings to my opponent when we were twenty years younger. This time he played a fairly innocuous variation (Bxf7+ followed by Bc4) while I probably missed the strongest replies. Eventually we reached a position where I was better, but I'd had enough excitement for one night and offered a draw. This may be a sign that I am getting old. I've mentioned the FIDE Trainers Commission Surveys before, but I thought I'd give them another plug. Put together by various chess trainers, they are distributed by the FIDE Trainers Commission, and are designed to assist chess coaches. They are usually about 4 to 10 pages long and can be downloaded as PDF's. The best part is that they are completely free to download and use. So if you are looking for some coaching material to use, or want to learn abot more yourself, you can get them from here. The 2013 FIDE World Cup will possibly end this evening, with Vladimir Kramnik a game up against Dmitry Andreikin (pronounced "And Ray Keene" according to some wags). Andreikin needs a win to send the match into playoffs, otherwise Kramnik comes home with the winners check. But just by making the finals, both players have qualified for the 2014 Candidates tournament. Kramnik of course was always expected to be there (by rating if nothing else), but for Andreikin this is a move to a higher level. As I type this Game 4 is in progress, and I may drift off to sleep following the action. Of course the venerable "4 move checkmate" may well be the most popular quick checkmate ever, although the majority of tournaments it occurs in are likely to be using scoresheets. Moving up to mate in 5's, the trap in the From gambit has claimed a few victims (1.f4 e5 2.fxe d6 3.exd Bxd6 4.Nf3 g5 5.h3?? Bg3#), while smothered mates on d3 and d6 start to turn up. 6 moves mates are still mainly Qxf7/f2 and Nd3/d6, but by move 7 we get to some cleverer mates. The Blackburne Schilling Gambit starts to show up (1.e4 e5 2.Nf3 Nc6 3.Bc4 Nd4?! 4.Nxe5?! Qg5 5.Nxf7 Qxg2 6.Rf1 Qxe4+ 7.Be2 Nf3#). 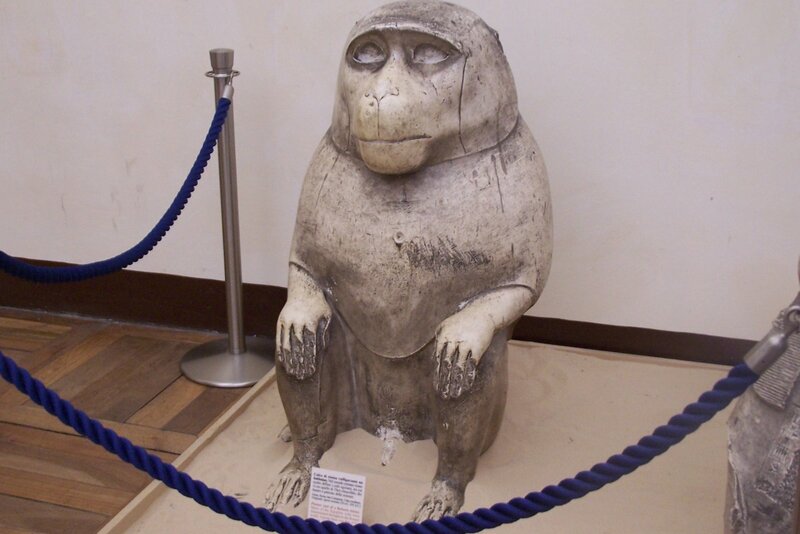 You also see some more 'normal' mates, with attacks on the castled king now becoming possible. Past move 8 it is pretty much a free for all. Certainly there are still traps for the unwary, but it is more a case of exploiting a blunder, rather than playing for a specific mate.